For over two years General Gordon's papers and letters remained in my custody, and they included the Equator and Soudan correspondence, which was so admirably edited by Dr Birkbeck Hill in that intensely interesting volume, "Colonel Gordon in Central Africa." The papers relating to China and the Taeping Rebellion were freely used in my history. To them I have the privilege of adding in the present volume an authoritative narrative of the events that followed the execution of the Taeping Wangs at Soochow, and of thus rendering tardy justice to the part taken in them by Sir Halliday Macartney. Among the contents of the large portmanteau in which all these documents were stored, I noticed a thick bundle of letters, in somewhat faded handwriting, and an examination of their contents showed me that they were of the deepest interest as relating to the important events of the Crimean War, and to the first seven years of Gordon's service in the Army. 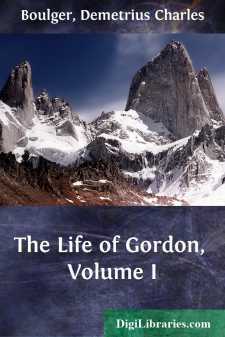 I at once went to Sir Henry Gordon, who honoured me with his friendship and confidence in no less a degree than his distinguished and ever-lamented brother, and begged of him permission to publish them. He at once gave his consent, which was ratified by the late Miss Augusta Gordon, the hero's favourite sister. The letters appeared in July 1884, under the title of "General Gordon's Letters from the Crimea, the Danube, and Armenia." In the proper place I have told what Kinglake, the historian of the war, thought of them and their author. In the rush of books that followed the fall of Khartoum, no favourable opportunity for carrying out my original purpose presented itself; and, indeed, I may say that the anonymous biographical work I performed during the course of the year 1885 would have filled a large-sized volume. Moreover, the terrible events of the fall of Khartoum, and the failure of the relieving expedition, were too close at hand to allow of a just view being taken of them, and it was necessary to defer an intention which I never abandoned. It seemed to me that the tenth anniversary of the fall of Khartoum would be an appropriate occasion for the appearance of a Life claiming to give a complete view and final verdict on the remarkable career and character of the man, with whom his own friendly inclination had made me exceptionally well acquainted. In 1893, therefore, I began to take steps to carry out my project, and to the notification of my intention and the application for assistance in regard to unpublished papers, I received from several of the principal representatives of the Gordon family encouraging replies. But at this time both Sir Henry Gordon and Miss Gordon were dead, and I discovered that the latter had bound her literary executrix, Miss Dunlop, a niece of General Gordon's, by a promise not to divulge the bulk of the unpublished papers during her lifetime. I am happy to say, however, that Miss Dunlop, without accepting any responsibility for what I have written, has with the greatest possible kindness read these pages, and assisted me to attain complete accuracy in the facts, so far as they relate to family and personal matters, but excluding altogether from her purview all military and political topics. For that co-operation, unfortunately restricted by the condition of the promise to Miss Gordon, I avail myself of this opportunity to express my grateful thanks; and I am also indebted to Miss Dunlop for the youthful unpublished portrait of Gordon which forms the frontispiece of this volume, and also for that of the house in which he was born.